Walt said, and is fond of being quoted for saying, “[Disneyland is] something that will never be finished.” Disney enthusiasts, whether they work for Disney or not, or are professional are not, reliably use this passage whenever an old attraction closes or a new attraction opens. Any dramatic change to a Disney theme park worldwide is likely to employ, when written about, this quote or one of the many similar excerpts on the parks and change from the canon of Walt Disney dialogue. The theme parks, however, are vast in scope and design and leave lots of room to tweak and fine-tune. These modifications are happening all the time, sometimes under our very noses with no guest the wiser. Some of these adjustments are for the better, some have no real bearing either way, and some will require more fine-tuning down the line. With the ability to take several trips to Walt Disney World over the past year, I was enabled to find some minor changes. Over in Disney’s Animal Kingdom’s Dinoland U.S.A., as the divide between Disney and McDonald’s continues the golden arches are seen less and less throughout the parks. Previously, as guests exited Dinosaur and made their way over to Chester and Hester’s, they had to walk by a series of signs with clever one liners punctuated with the McDonald’s logo, obviously trying to entice guests to eat McDonald’s menu items. Now, the McDonald’s symbol has been replaced by that of The Dino Institute and the one-liners have been swapped for the name of the dinosaur pictured above. Now, I’m not going to enter into the fast food health debate (today), but I will say that I believe this is a change for the better, if only for the budding paleontologists so that they can put a name to the face of the dinosaurs. 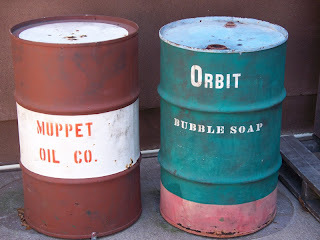 In Disney’s Hollywood Studios, near the exit to MuppetVision 3D, were a couple of barrels for Muppet Oil Co. and Orbit Bubble Soap. They looked like any rusted barrels you could find anywhere in the world, and yet, now they have freshly painted exteriors. The Muppet Oil Co. still retains its barrel, but Orbit Bubble Soap has been replaced by Itching Powder. This is a change with no apparent reason, and yet, even though they still appear to be old barrels, they do seem a little more aesthetically pleasing than their predecessors. " Disneyland is like a piece of clay, if there is something I don’t like, I’m not stuck with it. I can reshape and revamp,” this quote from Walt Disney is my personal favorite on change, because it shows the more malleable nature of the parks that are ever-changing. The next time you visit Walt Disney World, take a few moments to notice what has changed since your last visit. Take time to miss what has been displaced and enjoy the new sections, but above all, take time to look around. I had to laugh when I read your opening paragraph. I just used the Walt Disney quote in my latest post. I'm pretty happy that the McDonald's logos are disappearing from Disneyland and WDW. I know Disney has a history of seeking corporate sponsorship for attractions, but the McDonald's stuff always looked really tacky and out of place.